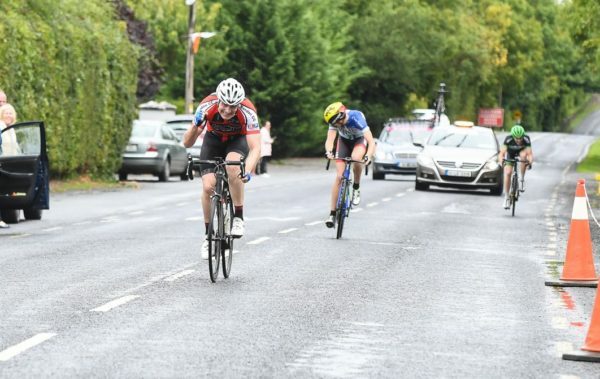 Neil Hodges of O’Leary Stone Kanturk has taken the overall A2-A3 title at the Charleville Two Day, with Jeremy Canty of Bandon CC winning the final stage. Canty would take the stage 3 victory on Sunday afternoon by two seconds from Hodges. Tom Shanahan (Limerick CC) was next, in 3rd place another two seconds back. And then crucially came a gap of 38 seconds to the next men home; Danny McDonald of Burren CC leading in a pack to take 4th place. That left Hodges the overall winner, but just one second, from Shanahan with the race going right down to the wire. A bout of cramps on the stage 3 run-in came at the worst possible time for Shanahan with the yellow jersey at stake. The A2-A3 riders had faced an 86.2km road race stage 1 on Saturday. And stage 2 on Sunday morning was a 6.1km TT. A breakaway had stolen a march on the opening stage. And there were further time gaps in the test on Sunday morning. But it was the gaps between the top three men, and back to the bunch, on the last stage that saw the final yellow jersey won and lost. 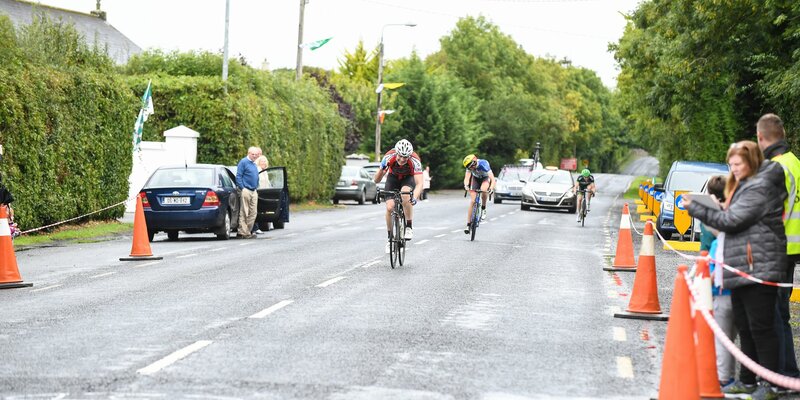 Liam Buckley wins stage 3 of the A4 race after also winning stage Saturday’s opener in a bunch sprint. But stage 2 TT winner Sean Buckley is in this 21-man group and he retained his yellow jersey to claim the overall A4 race title in Charleville. After the Sunday morning test, Saturday’s stage 1 winner Arminas Meskauskas (Collins Cycle Centre) who was still in yellow. He had won that opening stage by 14 seconds from a group of four with the bunch a further 10 seconds back. But after the TT his lead was trimmed back to just six seconds with the afternoon road race stage 3 remaining. He held the lead going into that final stage from Shane O’Connell, an international rower competing in cycling with Blarney CC as he returns from injury. And in 3rd place overall was the winner of the morning time trial Eoin Woods (North Tipp) at 17 seconds. Conor Halvey of NRPT-Chill Insurance was next in the overall standings after the stage 2 TT, some 18 seconds off the leader. The eventual race winner Hodges was in 17th place, some 38 seconds off the yellow jersey. However, when he managed to put so much time into the bunch, and also Shanahan, on stage 3 he took the title. Hodges was 2nd over the line on stage 3 just two seconds clear of Shanahan in 3rd; enough to win the overall by one second from the Limerick veteran. The A4 race ran on a different format; with a stage 1 road race and stage 2 TT held on Saturday. That just left Sunday’s stage 3 road race for the A4 riders. And going into that last stage it was Sean Buckley who had the yellow jersey. Unlike his team mate Meskauskas in the A2-A3 race, Buckley kept his race lead on stage 3 on Sunday and ran out the overall winner of the A4 event. The opening A4 race stage on Saturday was won by Liam Buckley of Newcastle West CC in a bunch sprint. His namesake and eventual race winner Sean Buckley then won the Saturday afternoon stage TT over the 6.2km course. He took the test victory and race lead by eight seconds from Shane Kelly and Newcastle West. Paul Noble of Wexford Wheelers was next followed by stage 1 winner Liam Buckley. And when Sunday’s stage 3 came down to a sprint from a group of 21 riders, there was no change at the top of the overall, though some of other placings close to the top did change. 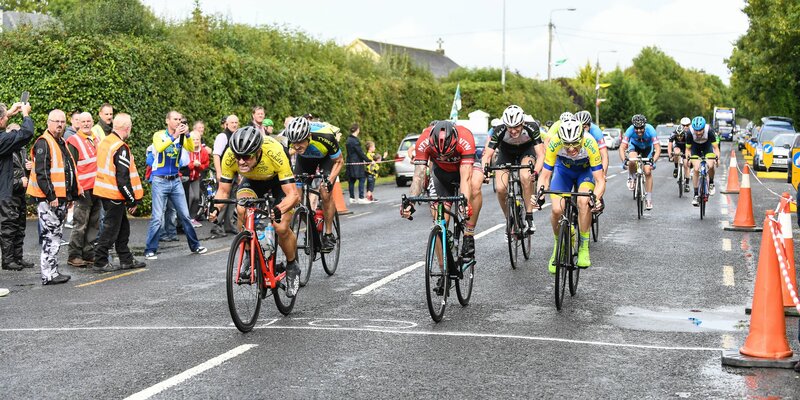 Stage 1 winner Liam Buckley took his second stage win in claiming stage 3 from Daniel Ronan (North Tipp) and Brendan Dolan (Drogheda Wheelers). Yellow jersey Sean Buckley finished 7th on the same time as the winner. Shane Kelly from Newcastle West and Paul Noble dropped out of the final top three – after being 2nd and 3rd overall going into the last stage – when they failed to make the stage 3 lead group of 21. Apologies for the lack of full results. We have posted the top 20 for each stage and top 30 overall for both races. The results were not available in a format that allowed the full results to be posted without spending hours re-formatting. However, the full results are available on the Charleville Wheelers Facebook page.